Take home dinosaur fossils, petrified wood, colorful rocks and precious memories from a day in the Eastern Montana badlands. Play paleontologist while you hunt for and excavate triceratops, edmontosaurus, and the elusive T-rex. 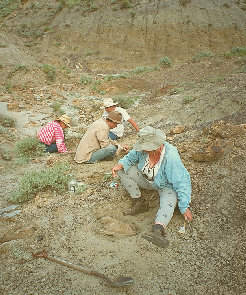 Baischs Dinosaur Digs, LLC, conducts paleontological day trips on a privately owned ranch, within view of Makoshika State Park, and just a few miles from the town of Glendive. 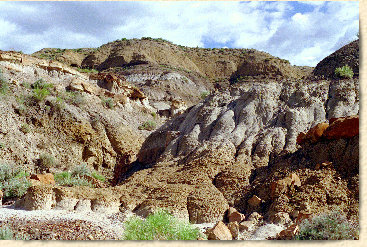 Much of the ranch is composed of the highly eroded gumbo of the badlands that is rich in fossil. 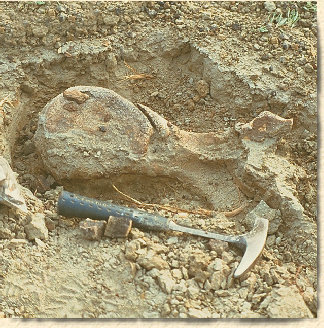 Since dinosaur bone begins to deteriorate within a few years of being exposed to the air, there is the constant quest to find and preserve fossils before nature turns them to sand. We invite you to come experience the unique beauty of the Hell Creek geological formations and get a little Montana dirt under your nails. Trek through landscape that even though it is composed of dissected sediments that have recorded Earths history, brings to mind visions of Mars. Our experienced guides will show you what to look for, how to excavate fossils if you find any and how to cast or prepare it. We will supply the needed tools and supplies for collecting. With a few exceptions, we will generally allow you to keep the fossils that you find. Although we encourage you to bring children who are interested, if you wish to bring children younger than six, please discuss it with us first. The parent or guardian is totally responsible for their children at all times. We require you to sign the Rules and Liability Waiver before going on a dig. Guided hunts can go out from April through October depending on the weather and conditions. Please be prepared to leave a message. Camera - optional, but highly recommended! Camping, motels and restaurants are available in friendly Glendive.